The Mass in A minor is for solo voices, four part chorus and orchestra. Scholars believe that it is almost certainly the Messa di Gloria composed in 1821 whilst Bellini was studying at the San Sebastinano under the guidance of Giovanni Furno and Giacomo Tritto. The manuscript is held in Catania in the library of the Civic Bellini Museum. The Mass, according to Anonymous, was reserved for a solemn occasion: the name day of Emperor Francis I, whose troops were in Sicily. The first performance in fact was held on 4th October 1821 in Catania at the church of San Francesco d'Assisi, the big church set on the square of its own name opposite Palazzo Gravina Cruyllas, the very house were Vincenzo Bellini had been born on the night of 2nd-3rd November 1801. The score belongs to his "juvenile" compositions yet there is nothing scholastic about it, for the Sicilian musician had wholly absorbed both his grandgather's precious lessons and the counterpoint teaching of Giacomo Tritto's strict school. The composer demonstrates that he is fully cognisant of all the secrets of the art of composition and applies them to his extraordinary musical and artistic talent. Though apparently simple, the harmonic and instrumental weave constantly offers us tokens of the musician's genius. The Mass alternates solo and choral vocal pieces in which monophonic plainsong alternates with polyphonic, contrapuntal form in clear, calm scoring. 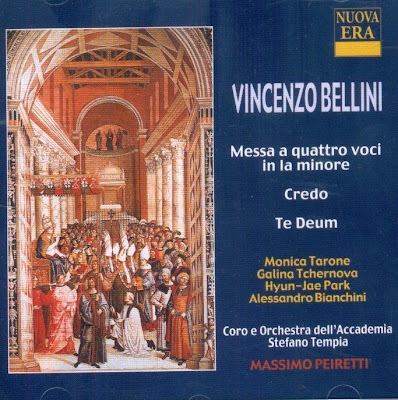 The CD was released by Nuova Era, 2002, (DDD). Nuova Era 7375.